Drain tofu of its water using a paper towel. If the tofu is wet, batter won't stick to it. Marinate tofu with garlic paste, salt and chili powder and let it marinate for half an hour. Make the batter by mixing the gram flour with green chili powder, salt, baking soda and sufficient water. Beat lightly to make a slightly thick batter. Add onions, dill, mint, cilantro and mix well. 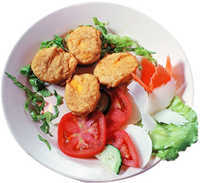 Dip each piece of tofu into the batter and deep fry on medium heat till it turns golden brown. Sprinkle some Chaat spice mix on it. its good and healthy food to eat.